USA Gold 2 Cash address, phone, website, hours of operation, and more. Turn your old, unwanted and broken jewelry into cash! 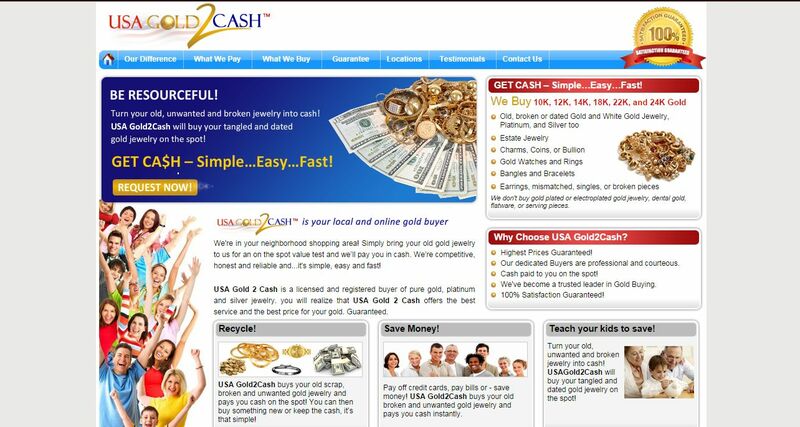 USA Gold 2 Cash will buy your tangled and dated gold jewelry on the spot! USA GOLD 2 Cash was established as an alternative buying service for precious metals including; Pure GOLD, SILVER and PLATINUM. USA Gold 2 Cash will promptly evaluate your old, unwanted gold jewelry and in most instances, pay you more than our competitors. Unlike Jewelry stores and pawn shops, there is no middleman, and no pressure to sell anything – 100% of our attention is paid to you — offering you the best, most competitive rates in the area. And that’s a guarantee! USA Gold 2 Cash will offer and pay you a fair and reasonable price for your unwanted, out-of-fashion, and broken gold jewelry: no middlemen, no pressure to sell anything. For your security, most cash payouts are made in the form of a MASTERCARD or Visa Debit Rewards card which you may use immediately at any ATM, deposit to your bank account, or make purchases with immediately!